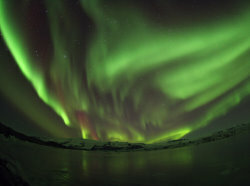 Northern lights are among the most marvellous natural phenomena and are a great experience. The journey will take you over the Arctic Circle, into the deep fjords of the Scoresbysund. Fantastic northern lights can be expected, we will look out for whales and hope to observe musk oxes in their natural environment. This voyage centers on Disko Bay, a region on the west coast of Greenland famous for its icebergs, whales, and friendly Inuit villages. 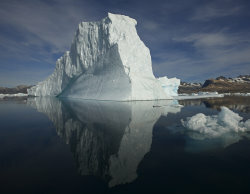 It departs from the capital of Greenland city of Nuuk and finishes in Kangerlussuaq. Attractions include volcanic landscapes, museums, iconic churches in numerous settlements, Greenlandic sled dogs, and stunning scenery everywhere. Our area of exploration encompasses a wealth of natural wonders such as the famous Ilulissat Icefjord, the beautiful Eqip Sermia glacier, the heart-shaped Uummannaq mountain, and breathtaking fjords, such as Nuuk fjord, reaching deep into the mountainous wilderness of Greenland. Explore a fascinating polar wilderness in winter. You'll be travelling with Polar Inuit at 78 degrees North by fair means, like Robert E. Peary and other Arctic Pioneers did! 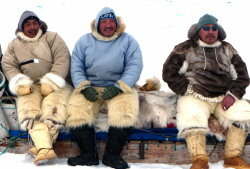 This is a very rare opportunity to experience the old 'World of the Eskimo' and a spectacular Arctic adventure.